On my usual blog, I talk about coding and writing and accessibility stuff. It's not really a place for squealing about beauty products and nail polish. Why not do that here?! I saw this product a while back at Ulta's, but I wanted to research it a bit before taking the plunge. I've had bad experiences with 'temporary' hair dyes not washing out. I literally spent half of my first grade with pink bangs due a can of temporary hair color, and a mother who didn't have the sense to test it on the tips of my hair. I didn't find any warnings about it not coming out, so I ran back and got some in teal and pink. It's a powder, much like a blush or eyeshadow. You apply it by removing the top, then taking a strand of hair and pressing it onto the powder, sliding the container from the top of the strand to the bottom. I found a flat lock of hair about an inch wide worked best. 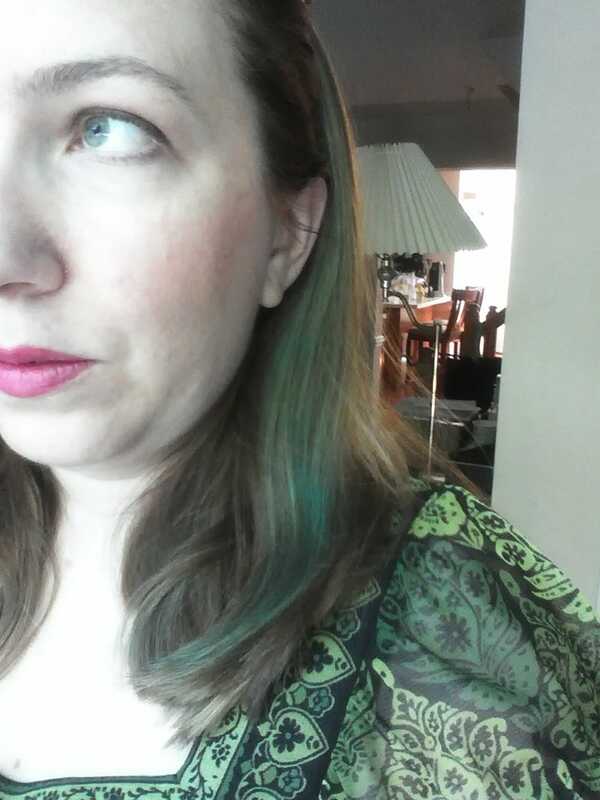 It is really nicely pigmented, but if you have dark hair, this isn't going to work for you. It shows up on me great, and I'm a medium brown with blond highlights. I saw several reports of it not taking on women with black hair. This is not a grab-and-go product. You're going to need hair spray and leave-in conditioner / detangler. I also strongly suggest having some disposable gloves, unless you love washing your hands for ten minutes. It does wash out! I freaked out when I noticed a bit of pink left on my first go around, but it came out the next time I shampooed. Style your hair first, then put it in. Then, do not touch your hair. Technically, it gets 'set' with the hairspray, but I noticed that the more I fussed with my hair, the weaker the color got. If it's blotchy, run a brush through it once. Anymore, and the color starts getting weaker and weaker. I didn't notice it coming off on to my clothes, but I was also wearing a rather dark outfit. This works best on day-old hair. If you have light-t0-medium colored hair, I totally recommend this product. It's fun, it's fast, and it isn't as messy as I expected it to be. Also, since it's a powder, it's much more travel friendly than some other temporary dye products. You can get Hypercolor online, or at higher-end beauty stores.